Born and raised on the Treasure Coast, Katie enjoys serving the community that has been her home. She has always been interested in skin and the numerous disease states that accompany it. Her passion for dermatology, ignited by working as a medical assistant in a dermatology office, made her want to help people as a physician assistant. Katie received her bachelor’s degree in biology with honors from the University of North Florida in Jacksonville, followed by a master of science in medicine from Mississippi College in Clinton. 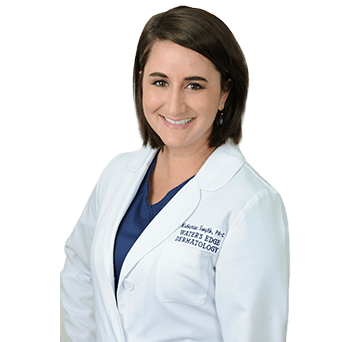 As a board-certified physician assistant, Katie champions regular skin exams to detect the resulting consequences of too much sun exposure to the largest organ of the body. In her non-working moments, Katie enjoys family time, horseback riding, traveling, boating, and fishing.